This is the first collaboration of Arabic Nadwah and Kubrick Poetry to host a session for Mr Ahmad Abdul Muti Hegazi, one of the most famous Arab poets today. During his visit to Hong Kong in November to read at the Hong Kong International Poetry Nights, he is also invited to be our honorary guest. Born in 1935 in Egypt, Mr Hegazi is 74 years old now still his intelligence and passion are like a giant mountain, firm and solid. He is considered one of the most important poets in the last 50 years in the Arabic speaking world. Among numerous contributions in the history of modern Arabic poetry, he is one of the pioneers who paved the way to free verse back in the 1950s. He translated a number of poems from French about urban life and published under the title Others’ Cities. 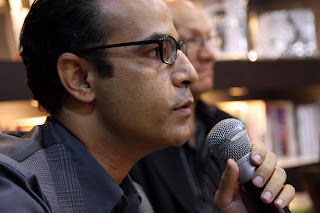 Currently, he is the Editor-in-Chief of Ibdaa—a quarterly literary magazine and writes a weekly article to Al-Ahram. He is the head of the poetry committee of the Supreme Council of Culture of Egypt. Mr Hegazi is a commanding poet who is capable to summon the attention of every individual. He remembers all of his poems by heart. When he reads, he does not read it from the paper, but in his heart, as if he is speaking to you. He tells you his story of exile, the story of a lonely woman, the story of sadness and encounter. And lighting her lantern in the daytime. Mr Hegazi speaks Arabic and French. How strangely, we seem to understand Mr Hegazi not only in the verbal translation by Sayed Gouda but in the body language and direct eye contact with him. Before speaking of justice, law and order, Mr Hegazi thinks love come first in humanity. In the name of love, we gather here to read the poems wrote down 30 years ago.